Northwest Kidney Centers is building two clinics with grouped treatment stations facing landscaped courtyards. Imagine flying to Chicago from Seattle three times a week, every week, for the rest of your life. This is the typical time commitment for people on kidney dialysis. They sit in a recliner for half a day, connected by tubes to a machine that cleans extra fluid and wastes from their bodies. This is what keeps them alive. Most dialysis clinics emphasize safety and efficiency over aesthetics. Some patients feel well enough to work on a laptop; others may watch TV, play games or sleep to pass the time. But the surroundings feel, well, clinical. And they quickly grow familiar for the 468,000 Americans who treat their chronic kidney failure with dialysis. A not-for-profit health care provider in Seattle is set to change that experience. Northwest Kidney Centers has been a leader in the field since it was founded as the world’s first dialysis provider in 1962. It will build its newest clinics with an eye to the healing power of nature. This vision aligns with its mission to promote the optimal health, quality of life and independence of people with kidney disease. “We are now the eighth largest dialysis provider in the country and we rate exceptionally well in federal rankings of dialysis quality. Yet we’re always looking for ways to improve patient care,” says Austin Ross, vice president of planning at Northwest Kidney Centers. Since the 1980s, research has shown that hospital patients with a view to nature have fewer negative observations and less pain after surgery. Similarly, employees with views of trees and landscapes took less sick leave per year than those with no view. 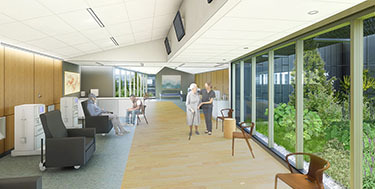 All 12 dialysis stations will face into a series of landscaped courtyards at the Rainier Beach clinic. What happens when big tech moves into small cities? Is modular the answer to affordable housing? Developers must ponder this: Save or scrape?